I've sent a message to the guy who made this to see if he'll come talk about it here. As far as I know, he's only done this Ford F-150 version so far. Very cool. Hopefully he'll come talk about it with us! It's the beginning of ecomodding becoming kewl. Metro, so this guy is selling these? Is there a link online? I give that cap two thumps up! As far as I know, they're not for sale yet. Last I heard, he was looking for F-150 owners to test them. No website that I can find - he posted to the MaxMPG group several months back, but hasn't yet answered me there or an e-mail to him. Aerodynamic truck cap saves 4 mpg!!!!!!!!!!! My name is Brett and I am the guy who has built the aero cap you started this post about. First of all, please accept my apology for not answering your email when you tired to contact me earlier. I found your post on a google search today and joined ecomodder right away. I am glad to know there are others out there who want to squeeze every mile out of the gas that goes into our tank that we can. As a nation, we have to do this to reduce our dependency on foriegn oil. As individuals, we must do this to reduce the amount of pollutants our fossil fueled vehicles emit into the atmosphere. The aerodynamic cap has been exciting and frustrating. The exciting part is it works! This has been proven through wind tunnel testing and road tests. The frustrating part is that I have been unable to obtain the financing to go to the next level. I have funded the development of the product while working a full time job. My work now takes me out of state and I must put the aero cap on hold for six months to a year. I would much rather set up production of the cap but I have to pay the bills. I tried to gain funding through the government. Nothing! I emailed my Senator on the matter four times and got no response. I emailed him a fifth time asking where I might send a campaign contribution to? I got a response to that email in less that 24 hours! Sorry I am getting political but I am frustrated by the politicians who loudly say we must develop more fuel efficient vehicles to reduce our dependence on foriegn oil. They need to put their money where their mouth is! There are millions of trucks in the US all of which could have improved fuel efficiency by installing an aero cap over the bed of the pickup. This would save millions of gallons of gas a day! But this will take a large production capacity which will takes millions to set up and get running. While my brother was in Iraq in 2004, he was shown a duffle bag with 2.1 million dollars in it in $100,000 dollar stacks. These were called footballs. The money was passed out to Iraqi citizens to help them start businesses to shore up the economy in Iraq. True story, it was on 60 minutes. There is over 3 billion dollars that is now unaccouted for. Don't get me wrong, I have nothing but the well being of the United States at heart and would give my life for this country, as my little brother almost did. You have to think about how much could be done to reduce our reliance on foriegn oil if some of that 3 billion dollars would have been made available to folks like me and to others, who are probably even more deserving, who are developing fuel saving technologies on a shoe string budget. The biggest irony is that I have to take the job out of state so I can pay the taxes from 2007 which will be due in April, because I used the money I should have been paying in to the I.R.S. quarterly for taxes, to develop the aero cap. You see my frustration. Sorry to be so long winded. Oh by the way my truck went from a baseline of 18 mpg average on the freeway to 22 mpg. Combined went from 16 mpg to 17.7 mpg. You can see how much fuel a pickup truck owner could save. You can see how much the millions of pickup truck owners in this country would save if they had an aero cap. So when you vote for your candidate of choice, I hope when they say we need to reduce our dependency on foriegn oil, they are not just spewing forth campaign rhetoric. Last edited by bondo; 01-16-2008 at 07:30 PM.. Sorry to hear you've run into a dead end on the route you were pursuing. Obviously you're passionate about the potential of what you've done - and the results speak for themselves. Out of curiosity, how many have you made? Great to have you here! Have you talked to any dealerships or speciality shops about your bed cap? It looks very professional and I would definately sport one if I had a truck. $2812.50 = cost @ $3.00 / gal. $2542.37 = total cost @ $3 / gal. If all the driving is all highway based, going from 18 to 22 mpg the savings become 151.5 gal., and almost $455! Talk about a good ROI. You'd think truck owners would go for that. Amory Lovins would sure approve. I figured out why I love this cap! It turns your pickup into a giant hatchback! I have made two with one in the mold. I intend to do a test market this fall after my contract is up. Glad I found ecomodders and thanks for posting the pics of the aero cap. I submit a couple more pictures of two other configurations the cap can be driven in. Aerodynamics go to pot but after you haul tall cargo or camp out you can change it back to the aero configuration. Thanks Ben for the compliment. 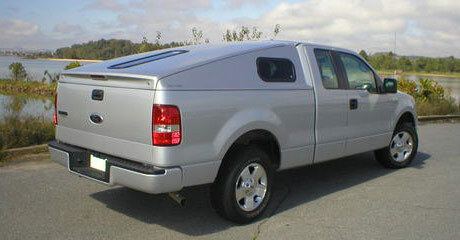 I hope if you do get a pickup truck in the future, the aero cap will be available to you. Thanks for crunching the numbers. I have so many times too. If I had the money now I would be under way. Maybe something will break, but for now, the tax man cometh!